GENEVA (Reuters) - U.N. Secretary-General Ban Ki-moon called on countries on Wednesday to re-settle nearly half a million Syrian refugees in the next three years, but only Italy, Sweden and the United States immediately announced plans to play a part. The United Nations refugee agency aims to re-settle some 480,000, about 10 percent of those now in neighbouring countries, by the end of 2018, but concedes it is battling to overcome widespread fear and political wrangling. Prior to Wednesday's ministerial-level talks, countries had pledged 179,000 places since 2013, refugee agency figures show. 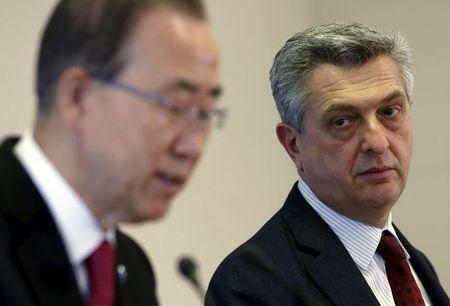 "We have heard pledges that increase resettlement and humanitarian admission to over 185,000," UN High Commissioner for Refugees Filippo Grandi said at the end of the meeting - signalling an increase of just 6,000 places. Commenting on the outcome, aid groups Oxfam and the Norwegian Refugee Council said governments had shown "a shocking lack of political and moral leadership." "Almost all states attending have failed to show the level of generosity required," they said in a joint statement. The European Union proposed that 54,000 places never attributed under the EU's own relocation scheme be used to admit Syrian refugees from Turkey, on a voluntary basis, Grandi said. "Altogether it could provide solutions for tens of thousands of Syrian refugees," he said. The EU and Turkey last week struck an agreement intended to cut off the flow from Syria, but arrivals along the main migrant route into Greece rose sharply on Wednesday. Migrant flows from sub-Saharan Africa across the Mediterranean are picking up too, and Italy's coast guard and navy vessels rescued 1,361 from boats and rubber dinghies on Wednesday. Ban urged countries to pledge new legal pathways for admitting the refugees, such as resettlement or humanitarian admission, family reunions, as well as labour and study opportunities. "Success at this high-level meeting today will drive momentum in the months ahead," Ban told reporters, pointing to a series of upcoming conferences. Italy and Sweden made concrete pledges to resettle an additional 1,500 and 3,000 refugees a year respectively, but not all of them would be Syrians. "Last year over 163,000 people, 51,000 of those from Syria, applied for asylum in our country – the highest number per capita in all of Europe," said Sweden's Justice and Migration minister Morgan Johansson. U.S. Deputy Secretary of State Heather Higginbottom, referring to commitments already announced by the Obama administration, said her country could resettle at least 10,000 Syrian refugees by the end of September. European Union Commissioner Dimitris Avramopoulos said 4,555 refugees from Syria's neighbours had been resettled in 11 EU states in its scheme for 22,504 people established last July. "My country is working on strengthening the ceasefire and assisting the (Syrian) government in combating terrorist groups," Gennady Gatilov, a Russian deputy foreign minister, said. "These are people with death at their back and a wall in their face," U.N. High Commissioner for Human Rights Zeid Ra'ad Al Hussein said. Syria's ambassador Hussam Aala urged countries to "repatriate refugees and not resettle them in third countries" so as to ensure against "brain drain". He also urged support for Syrian peace talks while lifting "unilateral economic coercive measures".